You are wasting your time if you are looking at Ranking Reports to assess the success of your SEO campaign. Worse – if you agency sends you a regular ranking report (and no traffic report), they are probably deliberately trying to hide their poor performance. Ranking reports are often used by agencies to suggest success while they are delivering very little in value (i.e. more traffic.) They distract from business goals and focus your search campaign on the wrong tactics. They are used to rationalize exorbitant retainers that deliver little in the way of new business. So, how can a site rank for a term, yet fail to generate traffic? Remember that little thing called Google Local Maps Places that dominates the screen area for most localized searches (including legal searches)? Ranking Reports completely ignore Places results. Legal SERPs very frequently integrate Places – so your glowing Ranking Report displays a very misleading picture of your site’s ability to generate traffic. Search engines are increasingly delivering personalized results based on the individual searcher’s geography, previous search history and social graph. A “divorce lawyer” search from my office will generate a results page with Seattle area divorce lawyers). My news related searches disproportionally return CNN.com because they know I visit that site on a daily basis; whereas my father may return Fox news results. Attorneys will frequently sit in their office, run a ranking check for a specific term they want business for, be pleased when their site shows up #1, yet puzzled that their phone isn’t ringing with a flood of incoming prospects. What they don’t realize is that the search engines are personalizing their results based on previous surfing history. The Ranking Report is delivering a false positive because the single most frequented site by any attorney is their own site. The big picture: With the exception of the false positives from previous search behavior, personalization isn’t taken into account by ranking reports. My searches include results from people with whom I connected via the social graph. Google calls this Search Plus your World. (Bing functions in a similar fashion.) Depending on the searcher and the subject matter, research has shown up to 60% of results can be influenced by the social graph. Searches are increasingly specific – think “trial for my third DUI arrest” instead of “DUI Lawyer”. This is known as the long tail. 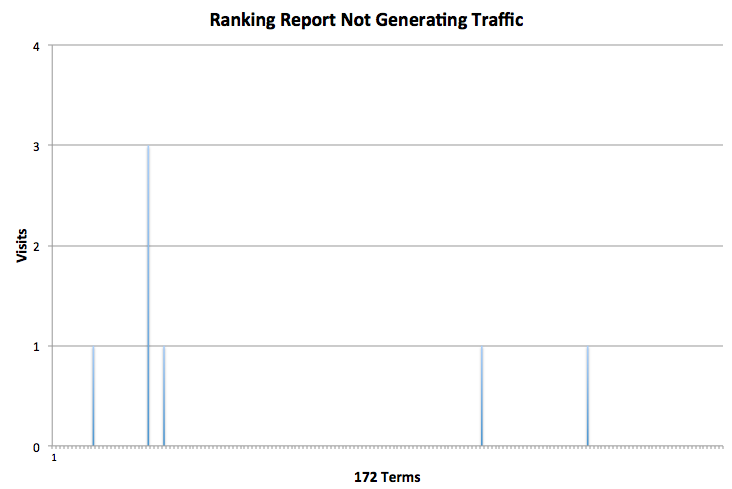 Focusing on ranking reports misses all of the traffic within the long tail. To get a feel for how the long tail works – look at all of the different terms that bring traffic to the profile page on your website. If you are like most attorneys you’ll see something like: “William O’Smith”, “Billy osmith”, “Bill O. Smyth”, “Bill Smyth Avvo Rating.” “Bill Smith Lawyer” “Bill Smyth phone number” etc. Additionally, its very easy to generate a positive rank for an obscure term. Think “fuzzy bunny slipper lawyer”. As more and more consumers are accustomed to search engines automatically geographically targeting their query, (think “personal injury lawyer” instead of “Poughkeepsie personal injury lawyer” they are frequently dropping the geographic component of their search. A lot of erroneous ranking reports I’ve seen have obscure geographic references in them that are never searched by anyone (zip codes, townships etc.). Instead of monitoring the search engines for how your site ranks for a finite set of terms, use metrics that really drive your business. Look at the inbound traffic to a page or group of pages within a practice area. This can be done easily in Google Analytics with the “landing page” report. Alternatively, use a keyword or a group of similar keywords to track inbound search traffic for a specific practice area – “divorce”, “implant”. Changes in traffic that include these keywords demonstrates progress (or decline) in your site’s ability to generate business – not just ranking. I made a decision 3-4 years ago to never again provide a ranking report to clients. I tell prospects this before they commit to working with me and invite them to find another consultant if they want to track rankings, or to do it themselves. Best SEO decision I ever made . . . My clients hire me to help them make more money. The ones who seem more concerned with rankings than money get referred to other SEO consultants.